…have you looked through the Frequently Asked Questions page to find your answer? You can also pick up the phone and call us at the number below, but if it’s after hours, if we’re experiencing a higher than normal call volume, if we’re talking with another customer or installing a shelter – or if you’d prefer to communicate via email – then go ahead and complete the form at the bottom of this page and let us know what questions you have regarding tornado shelters and tornado safe rooms and we’ll get back in touch with you as soon as possible. Also note that we make and return calls between 8am to 9pm Central time, 7 days a week; We do installs from dawn to dusk 7 days a week, weather permitting (subject to availability). —–> For storm shelter and safe room pricing information, click on the PLACE ORDER tab at the top right of the page (or just click here). And don’t forget to fill out the form on the right side of the page to make sure you get all the latest updates and information on storm shelter availability and storm safety tips, including your FREE Severe Weather Guide App + FREE subscription to WeatherCall @Home, the premier address-specific weather alert notification service, to keep you informed and aware of severe weather approaching your home or business. If you’d like to come by our facility in Huntsville (Showroom coming soon! ), please call ahead of time to schedule an appointment so we can arrange to meet you and show you the different storm shelters and tornado safe rooms on-site (will vary from day to day depending on what orders have arrived, waiting to be installed; during storm season we usually aren’t able to carry any inventory due to high demand). Other than by phone, you can contact us electronically by filling out the form below with your question or comment regarding tornado shelters or tornado safe rooms and we will get back to you as soon as possible. Be sure to include a phone number, your location, and the shelter brand & size you’re interested in so we can give you accurate pricing information. We appreciate you! Thank you. My name is Ragan. 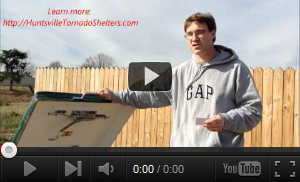 I work with a major cable network that would like to use a few seconds of your “Storm Shelters: Installing a Huntsville Tornado Lifesaver Storm Shelter” video for the opening title of a new show about doomsday. Please contact me back ASAP to let me know if you’d allow us to use your video. Just a note to say how thrilled to have our Storm Shelter finally installed! Danny Robinson and his excavator operator, Bubba, were the friendliest, most courteous and professional people we have ever dealt with. They arrived on time ans started digging. It took them 4 hours to complete the job as they encountered unexpected large rocks. They used ingenuity in working around the rock where they could and chipped away parts of it so they could install our shelter. We pray we never have to use our shelter in a tornado but if we have to, we will be safe from any harm.